One way to get around the CRT size limitation is to project the images from a smaller CRT onto a much bigger screen as in a Rear Projection TV. They were the first real big-screen TV, but they have evolved dramatically in the last few years. Some rear projections TVs (RPTVs) are analog. If you use an antenna or rabbit ears to receive your TV signal, after the Digital Transition in 2009, you will need to buy a converter box to continue watching TV on one of these sets. RPTVs come in various sizes from about 42 inch diagonal up to 80 inches. The 42-inch models are like large TVs, but the 80-inch sets are appropriate for a home theater. They are less expensive than a similar sized plasma TV . If you want the biggest picture possible for the money, a rear projection TV is a good choice. The rear projection television is the simplest system to set up, next to a conventional tube style television. All you need to do is uncrate it, put it where you want it, plug it in and turn it on. They used to be thick and boxy looking, but these days with the new digital light engines, most of them are less than 18" deep. They tend to perform reasonably well with some light in the room and have limited viewing angles. They are best for viewers that can be positioned directly in front of them at eye-level. The phenomenon of picture dimming occurs as you move away from the center-viewing axis. This happens when you move from side to side, looking at the picture from an angle. If you have a viewing space that requires seating to be placed at relatively wide angles to the screen, you should re-evaluate a rear projection television as your choice. Some have a tendency to reflect the light in the room. If you are upgrading to a large screen TV for your home theater, the rear projection TV has an adequate audio system if you don’t want to buy a surround system right away. 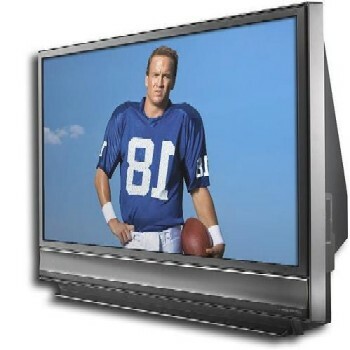 Although the rear projection televisions are much thinner than in the past, when compared to front projectors and flat screen TVs, they are the bulkiest big screen TVs on the market. The new micro display-driven rear projection TVs have lamps that burn out over time. Replacement Lamps can range from $100 to $300.